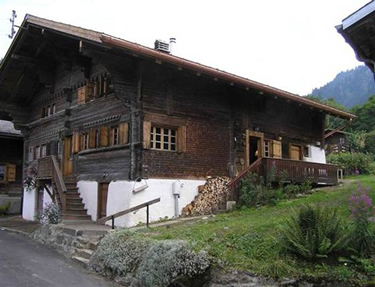 This beautiful chalet lies in a perfect environment for various mountain activities like skiing and hiking. The house dates from 1722 and is built from beams which have been scorched black by wind and weather in the course of the centuries. Much of the interior has remained in the original state, such as the old woodwork and the low ceilings. The house was totally renovated in the summer of 2005, and is decorated in a comfortable and attractive manner, in keeping with the spirit of the origins of the building. The roof was renewed and isolated and a new bathroom was installed on the first floor. The kitchen is fully equipped. There is also internet available, which makes it a perfect location to work in a quiet environment. The right half of the cottage is for rent. La Forclaz is of one the last villages in Switzerland where mass tourism and commerce are not yet predominate. In the village, there is only one restaurant and a ‘laiterie’ which sells fresh cow’s milk every morning. A weekly market is held every Thursday morning during the summer, where you can buy (and taste) typical Suisse products from the local farmers. The village is still entirely original and consists of approximately 100 beautiful old wooden chalets, some with beautiful hand-painted texts on the façades. The chalet lies on a hill in the middle of the village, with a beautiful view of the neighbouring mountains of Leysin and Les Diablerets. Behind the house, there is a large garden with two terraces; one adjacent to the house and one in the back of the garden with a view of the village. Behind the garden, at the bottom of the hill, runs a small stream. Hall with wardrobe and a rack for hiking- and ski shoes. Large open living space including a cozy sitting area, dining area and open kitchen. In the sitting are are a television set, DVD-recorder and an audio system. Heating is provided by means of a rotating wood-burning stove situated in between the sitting are and the open kitchen. Electric radiators are present for additional local heating if needed. The open wooden kitchen is new and is laid out with a cooking island, a large induction cooking plate, large refrigerator, (freezer in the cellar) oven with microwave, dishwasher and extractor fan. There is also a water cooker, fondue set, coffee-, bread- and tostiemachine. The terrace can be reached by a door in the kitchen. The dining area contains a large wooden table which easily seats 10 people and a cupboard made of old wood taken from the house. Bathroom with bath, toilet, washbasin and washing machine. Large bedroom with a single and double bed (separate mattresses) and washbasin in the room. Bedroom with double bed (one mattress) and a washbasin in the room. Small cozy room with large window and a bunk-bed. Luxurious bathroom with a large double washbasin, shower and toilet. Bedroom with three beds (Lower). The cellar is used for storage. In the cellar are a freezer, BBQ, table, sunscreen, long chairs, langlauf ski’s and snow rackets for two. All these articles can be used by the renters, on condition you take care of it.